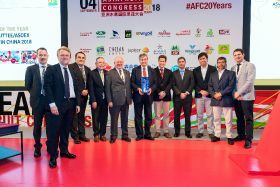 The Chilean Cherry Committee/ASOEX, Indian importer IG International, Indonesian retailer Ranch Market and US fruit industry stalwart Dalton Thomas each scooped a prestigious Asia Fruit Award at a ceremony held during the Asiafruit Congress in Hong Kong today (4 September). Recognising excellence and outstanding achievement within Asia’s fresh fruit and vegetable business, the annual Asia Fruit Awards celebrate different categories: Marketing Campaign of the Year; Importer of the Year; Produce Retailer of the Year; and new this year - the Impact Award for significant contribution. Winners are selected by industry publication and Asiafruit Congress organiser Asiafruit Magazine, and Asia Fruit Logistica representatives. 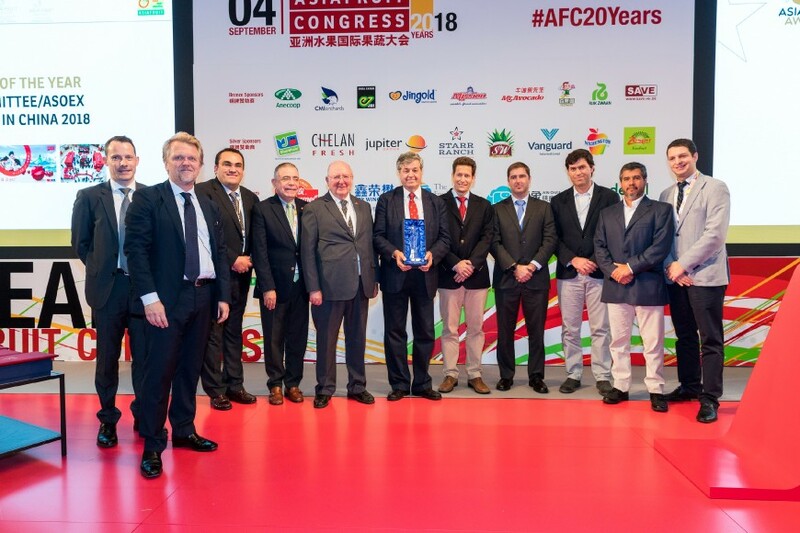 The Chilean Fruit Exporters Association (ASOEX) and its Chilean Cherry Committee won the 2018 Marketing Campaign of the Year for their high-profile campaign to promote Chilean cherries in China during 2017/18. Commenting on the award, Ronald Bown, chairman of the board of ASOEX, said: “We are honoured to receive this prestigious award, which recognises the efforts and commitment of growers and exporters in Chile in facilitating the demand for our cherry exports to China and contributing through this campaign to strengthening our country’s image in Asia. Meanwhile, the Produce Retailer of the Year Award went to Indonesia’s Ranch Market. Formed in 1998, Ranch Market has become Indonesia’s leading supermarket targeting consumers with high-quality imported as well as domestically-grown produce. The group operates more than 35 stores under two main banners – 15 branded as Ranch Market, which caters to top-end consumers, and 20 branded as Farmers Market, which have a slightly larger store area and feature more locally-grown products. The inaugural Impact Award was presented to Dalton Thomas, who recently retired as president of leading Washington grower-packer-shipper Oneonta Starr Ranch. The Impact Award was launched at this 20th anniversary edition of Asiafruit Congress to honour a person, company or institution that has made a significant impact in developing Asia’s fresh fruit business. The four winners of the Asia Fruit Awards were presented with their trophies and certificates by Wilfried Wollbold, commercial director of Asia Fruit Logitica organiser Global Produce Events, and Chris White, managing director of Fruitnet Media International, which publishes Asiafruit Magazine and organises the Asiafruit Congress. The Asia Fruit Awards were presented before the Networking Lunch at Asiafruit Congress, Asia’s premier fresh produce conference event held in Hong Kong. The conference is the precursor to the Asia Fruit Logistica trade show, which takes place on 5-7 September at AsiaWorld-Expo Center in Hong Kong.